The thinnest lenses with light weight titanium frames for dress, casual or professional wear. ​The safest impact resistent lenses in Rayban or Rec Specs for sport and active wear. There are many factors that contribute to the price of a frame. Differences in materials, coloration, craftsmanship, country of origin, quality assurance and design all affect the price. Our experienced staff members are available to assist you with facial shape, recommendations, and design options to maximize the cosmetic appeal. Designers are a staple in our culture. In the eyeglass field they are also the sturdiest and best crafted frames on the market. The designers utilize modern materials such as titanium, one of the lightest weight and most durable metals available. Their flexible polymers and zyls (plastic) are often virtually unbreakable. Our extensive collection of designers include both American and European Designers. For over 70 years, Ray-Ban has been the recognized leader in protective and attractive eyewear. Their commitment to technology and quality prompted the U.S. Army to outfit their pilots with Ray-Ban sunglasses and this authentic legacy led to the popular culture adopting Ray-Ban as an icon of cool. The eyewear line exudes a casual attitude and features whimsical details like charms, colorful lenses, and logo elements. Fysh is a unique brand of urban cool eyewear for people who live, love and lounge in a big way. Fun and funky styling, creative textures, and rich colors give Fysh UK its smooth, ultra hip essence. Created for men and women who appreciate potent design, while being confident about their own style, the new collection uses innovation in form and material to serve, not overshadow, the wearer's personality. Since the launch of this first collection, Bebe's luxurious, timeless designs attracted the most elite clients. The sophisticated combination of audacity, glamour, and sophistication, are well matched to the modern Bebe woman. This eyewear collection follows suit with styling that is seductive, elegant, and exclusive. Vera Wang is a native New Yorker who spent her career at the forefront of fashion. The Vera Wang brand reflects her vision to create a lifestyle that goes beyond core bridal and ready-to-wear, and into publishing, fragrance, beauty, accessories and home. Driven by artistic, modern and luxurious design and style, coulture-like quality and a high level of customer service, Vera Wang's collections hold impeccable customer appeal. ​The elegant lines of the frames, softly gradient lenses and stems with handset stones are details that ensure maximum comfort and retain that unmistakable touch that has always distinguished the Vera Wang style. These are independent lifestyle frame designs that createe premium handcrafted eyewear for independent people with a unique sense of style. These frames are hip and trendy and very fashion forward. Hand made Titanium frames that are some of the lightest in the world. If you love the feeling of not wearing glasses at all, this is the line for you. Authenticity is earned, and Oakley has spent more than three decades fusing innovation, performance and style to earn the respect of the greatest athletes on the planet. World's best known eye wear brand known for it's trend setting styles and hand crafted elegance. At Dr. Shah & Dr. Frohn Optometry, we have an amazingly large selection of children's eyeglasses. Our frames are fashionable, sturdy, and durable, as well as flexible. Our trained staff believes that a child's vision needs don't end with their eye exam. At Dr. Shah & Dr. Frohn Optometry, we have an extensive collection of sports eye wear including Rec Specs for most sports in both children and adult sizes, ski goggles in season, swimming goggles, and motorcycle protective eyewear. In addition, Rayban Sport SunGlasses can have prescription in their lenses for all your sport needs. We carry a wide selection of industrial safety eyewear approved by OSHA and meeting the ANSI safety standards. All safety eyewear lenses are made with industrial strength polycarbonate lenses for maxium protection. If you are a business looking for a source to supply your safety needs, please call us and we will customize a program for you. 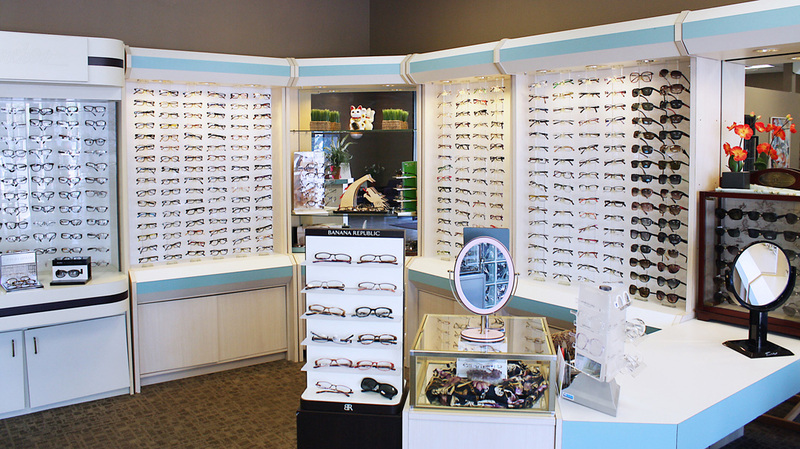 We have 1000's of frames to choose from...Please call our office at (562) 866 - 2020 to set up an appointment for an eye exam and let our opticain find Eyeglass or Sunglass frames right for your needs.